A few months ago I participated in my first kickstarter project. When I saw PowerUp 3.0 – Smartphone Controlled Airplane I knew I HAD to get in on the ground floor. Today I got my backer reward! I was actually really surprised by how well it was packed. I’ve never encountered this type of bubble wrap. I hope more companies move to this type as it appears to provide very good protection without adding very much bulk. PERFECT PACKAGE — Fly your PowerUp 3.0 airplane non-stop. Charge one while you fly the other. Includes 1 BAREBONE, 1 BASIC PACKAGE, 1 Lithium Polymer rechargeable power pack (1000 mAh) good for 13×10-minute flights, a USB wall adapter (220V/110V), and a personalized pre-folded paper plane signed by Shai. After all the stretch goals I also got an additional rechargeable power pack! After the project was funded I took the opportunity get an additional barebone package. In total I spent $105 for 3 PowerUp 3.0 modules, 2 rechargeable power packs, and a ton of paper planes (plus one signed by Shai). Great deal. I was also really impressed with the actual packaging. I’m not sure what the actual retail package will be, a single PowerUp 3.0 unit, a rechargeable power pack, and a replacement prop and rudder, would seemingly be a good bet. I can only imagine that these will be making there way into your local hobby shop. I’d also look for them at Hobby Lobby or similar. The build quality is very nice as well. Everything looks very well thought out. My only concern is the thickness of the carbon rod that connects the control unit to the rudder and motor. I’ve seen this same exact setup on my Blade mSR and mCPx. While both of those helicopters went through some good crashes I had to replace the carbon tail booms on them both. I wonder how much abuse they will take. After getting and opening the backer’s kit I kind of wish I went for the hacker pledge level. I think it would have addressed my concerns about the boom’s strength and how hard it would be to replace. Also, the first thing I did was take a balsa rubber band plane and see if I could get one PowerUp on each side of the wing. It turns out that the app will only support one unit at a time. Luckily, the code is open source and is on GitHub. Guess I’ll have to look into working on the Android app! I didn’t get a chance to charge up everything before it got dark. Over the next day or so I’ll post an update on how well they fly. Tagged Kickstarter, RC, RC Aircraft. Bookmark the permalink. 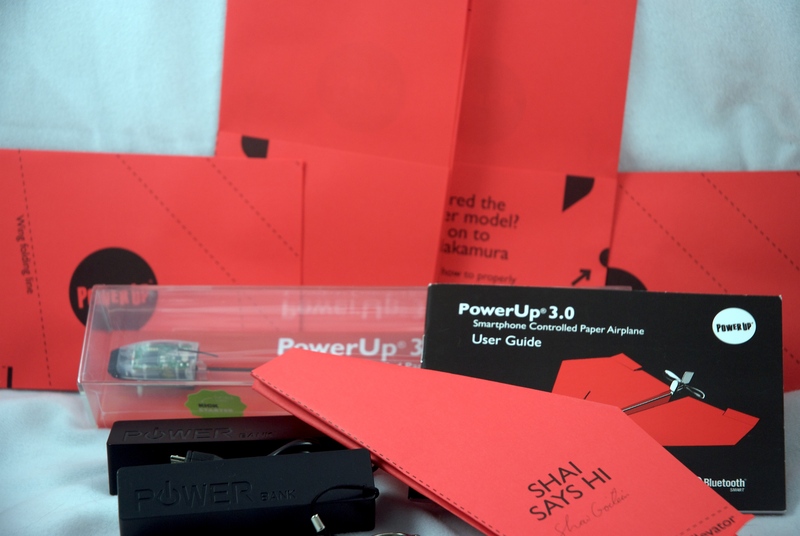 One Response to PowerUp 3.0 Kickstarter? Kickstarted!